NOAA’s National Geodetic Survey (NGS) has recently added 43 GPS tracking sites into the Continuously Operating Reference Station (CORS) network overseen by the federal agency. The network helps ensure the consistency and accuracy of the nation’s spatial reference system. Each CORS site provides GNSS — GPS and GLONASS — carrier phase and code range measurements, recorded on a 30-second or shorter interval (see figure). Data are free and accessible via the Internet. 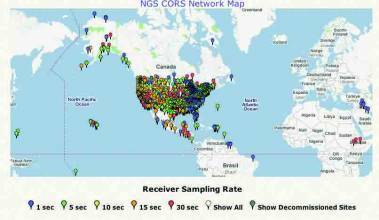 NGS invites organizations and individuals to share data from their permanent GPS base stations by including these stations in the National CORS network, following a rigorous a set of criteria established by the agency. The NOAA CORS network now contains more than 1,200 sites spanning the United States, its territories, and several foreign countries. Surveyors, GIS users, and others can combine their own GPS data with GPS data from the CORS network to determine three-dimensional positional coordinates that approach a few centimeters in accuracy. Alternatively, users can submit their GPS data to the web-based Online Positioning User Service utility to have NOAA compute such coordinates automatically. Among the new sites are 13 established by the Federal Aviation Administration as part of its Wide Area Augmentation System (WAAS). Four of the new WAAS sites are located in Alaska, four in Canada, and five in Mexico. WAAS provides differential GPS correctors for airline navigation across North America. These correctors help more precisely determine a position and enable pilots to determine the three-dimensional location of their aircraft with an accuracy of a few meters. The WAAS network now contains 38 GPS tracking sites. According to NOAA officials, the addition of the new sites significantly improves both the geographic coverage of the CORS network as well as the accuracy with which CORS users can position things, including property boundaries, transportation arteries, buildings and other map-worthy objects. The expanded coverage will also benefit those organizations that apply CORS data to monitor “space weather,” including the distribution of water vapor in the atmosphere and the distribution of free electrons in the ionosphere. Knowing the distribution of water vapor is critical for accurately forecasting severe weather such as hurricanes, tornadoes, and thunderstorms. An overabundance of free electrons in the ionosphere can disrupt those communications services that involve satellite links.